Last week we covered Parkopedia that finds parking spaces for you – free street parking, public garages, etc. Now we have ‘Parking In Motion‘, in its early stages, that will find the available or full parking parking at your destination. Parking In Motion is instead working with garage operators to collect this data on a broader scale. But first it might have to help operators actually get that data themselves. Similar to Parkopedia, this can also help you find garages and, in some cities, street parking too. 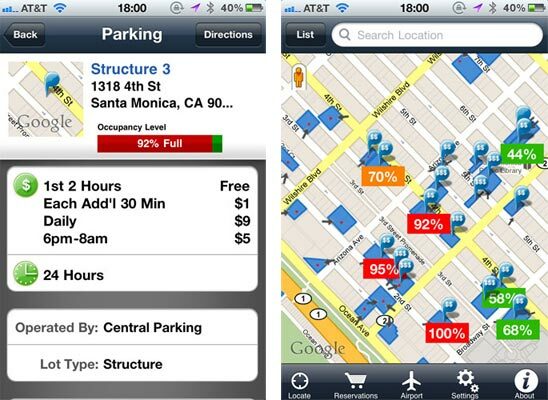 This app also provides the parking charges, operated by and timings of the public parking structures. Tighter integration with parking structure operators will eventually allow drivers to reserve spots and to pre-pay for them, possibly with a discount. This is where Parking In Motion will make its money, taking a percentage of those transactions. They have an iPhone app will also, eventually, offer advice on street parking. It won’t be able to direct you to a specific spot, unfortunately. Even though many cities are installing smart parking meters, the data collection is too slow to direct drivers to open spaces. Rather, Parking In Motion will collect data from users and meters and tell them which streets or areas are most likely to have open spots, and how long it will likely take to find them. The company’s flagship cities are Philadelphia and Santa Monica, Calif., where it has reservations and street parking data coming online. But it has garage data in about 300 cities, and the iPhone app is free and available in the App Store today. If–big “if”–the company can find a way to get this data, it will be able to not just profit from it directly, OpenTable-style, but also provide APIs (possibly fee-based) to every other navigation service provider out there. Think how much more useful your GPS device (or GPS app) would be if it calculated your arrival time after considering the time it takes to park. Meanwhile, the company has to hope a bigger navigation provider, like Navteq (owned by Nokia) or Google, doesn’t muscle in to the space. They have apps for iPhone, Android and Blackberry.